Tony Gilley, President of Gilley Enterprises of West Monroe, La. 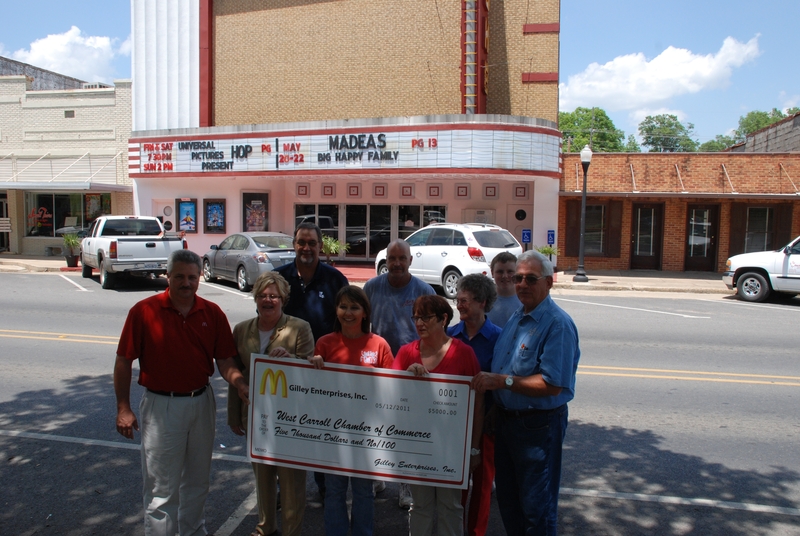 recently donated $5,000 to the West Carroll Chamber of Commerce Fiske Theatre Account to be used for renovations to the theatre’s marquee lighting. The theatre wasted no time in putting the money to work, theatre staff along with David Stauffer of S&S Electrical and inmates from the West Carroll Sheriff’s office replaced the 81 light fixtures in just three days having the marquee back in operation by the weekend’s showing of Madea’s Big Happy Family. “This donation from Mr. Gilley shows how his organization is dedicated to the communities they are apart of, we look forward to working with him even more when the restaurant opens this fall,” Holland said.